Bad news folks! Very sorry to announce that we are postponing both screenings this weekend. Groundhog Day in Leinster Cricket Club and The Van in Dalymount Park are both postponed. It's just too cold and changeable. Friday will be as cold as 4-5ºC after sunset and Saturday is a complete washout! 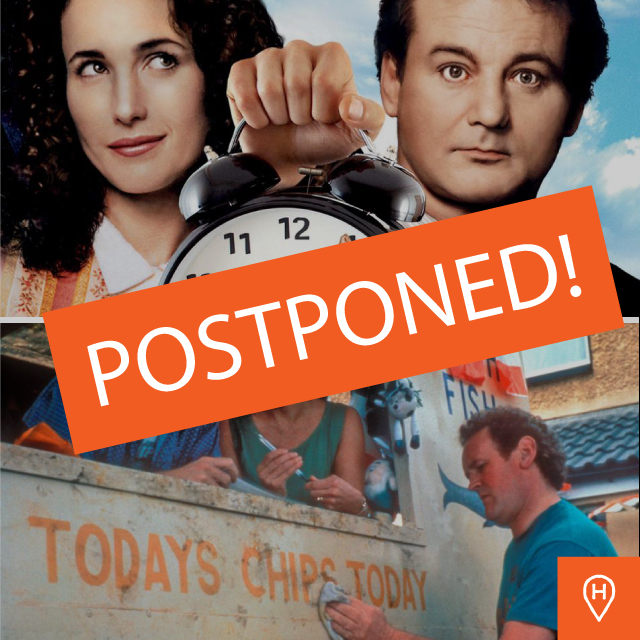 Groundhog Day is postponed to Friday 15th May, and The Van has been postponed until the 14th May. Sorry for having to do this. It's the nature of running open-air events in Ireland. Can't wait for warm sunny days in the park! Once the weather comes good we'll also be kickstarting our open-air cinema in Merrion Square each week. Make sure to join our facebook event page to be in on all the action. We're also looking forward to the Bizarre Bloomsday Brunch in June. Tickets are selling fast! And if you're stuck for things to do this weekend, make sure to check out our friend's event-listings at LeCool Dublin and in Totally Dublin. Phizzfest, the Phibsborough Community Arts Festival has loads on too.